Our work at Nature Iraq involves all aspects of Iraq’s environmental health. After years of neglect and abuse due to 35 years of war and sanctions, Iraq’s environment is not only in great need of care and rebuilding, but is in dire need of overall evaluation of its present condition. This is especially true as our country’s leaders move forward with reconstruction and socio-economic development efforts that will allow Iraq to play a positive role within the global environmental community. Whether one believes the source of today’s world environmental problems are climate change-induced or not, their effects are enormous, devastating and do not recognize man-made borders. Loss of land due to spreading desertification causes increased conflict and displacement, affects weather patterns and regional temperatures, creates adverse health conditions such as infant mortality rates and respiratory illness, and impairs global carbon sequestration capacity. Just as particles from dust storms emanating from the Gobi Desert reach and affect air quality in China, Korea, Japan and North America, the dust storms of southern Iraq cause asthmatic deaths in Baghdad and cloud the skies of not only of Kurdistan, but flow across Iraq’s borders. Equally alarming, growing populations with their related increases in economic activity and water usage result in higher pollution levels, especially in the agricultural sector, and adversely affect water supplies worldwide. We at Nature Iraq are well aware of these detrimental trends and are working - by way of ongoing field surveys and monitoring - to create an accurate baseline representation of the present-day condition of Iraq’s environment in the north and south. Survey results are being used to determine the capability of Iraq’s environment, in terms of supporting appropriate and sustainable socio-economic development. Our hope is that by working from this environmentally-centered blueprint, adverse trends within Iraq - many of which are the result of human action and not only affect Iraq’s environmental health, but also that of our immediate and distant international neighbors - can be reversed. Working alongside other environmentally conscious partners, we are for the first time in history addressing the overall environmental health of a nation, including issues of water scarcity, sustainable farming, pollution, and environmental restoration, before the cessation of violent conflict. While this sometimes involves working under extremely insecure conditions, we at Nature Iraq believe that a healthy and sustainable Iraq is the only option as we move forward to address the many environmental issues within our country. 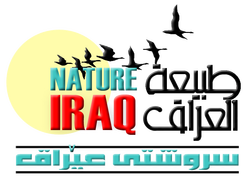 Nature Iraq feels strongly that this work is fundamental to the future of Iraq and its people.